Yue is a research associate in Center of Systems Integration and Sustainability at Michigan State University on a NSF project that explores complex dynamics of telecoupled human and natural systems. Having been fascinated by the complexity of coupled human-natural systems since her senior year in undergrad, Yue accumulated 10+ years of experience in GIS and RS applications, land use models (particularly CLUE-S and ABM), and sustainability. She is constructing an agent-based model to represent the soybean trade between Brazil and China, which will serve as a tool to help us understand and analyze telecoupling interactions and their impacts on sustainability. 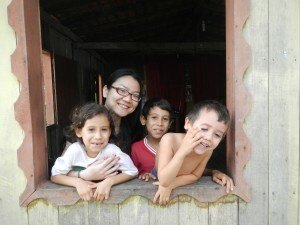 During her PhD project, Yue investigated the resilience of vulnerable communities in less-developed areas (i.e., the Caboclo communities in the Brazilian Amazon delta) by quantitative methods and agent-based modeling. Besides research, Yue lectured Principles of GIS science, a major undergrad course in the University of Waterloo. Yue is also a fan of sports, particularly rock climbing and starting strength. Her goal by the end of this year is to deadlife 220lbs.